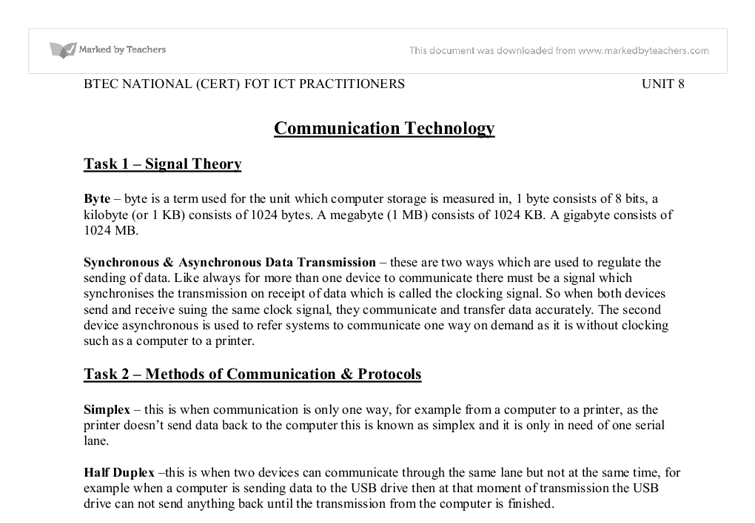 Communication Technology Task 1 - Signal Theory Byte - byte is a term used for the unit which computer storage is measured in, 1 byte consists of 8 bits, a kilobyte (or 1 KB) consists of 1024 bytes. A megabyte (1 MB) consists of 1024 KB. A gigabyte consists of 1024 MB. Synchronous & Asynchronous Data Transmission - these are two ways which are used to regulate the sending of data. Like always for more than one device to communicate there must be a signal which synchronises the transmission on receipt of data which is called the clocking signal. So when both devices send and receive suing the same clock signal, they communicate and transfer data accurately. The second device asynchronous is used to refer systems to communicate one way on demand as it is without clocking such as a computer to a printer. Task 2 - Methods of Communication & Protocols Simplex - this is when communication is only one way, for example from a computer to a printer, as the printer doesn't send data back to the computer this is known as simplex and it is only in need of one serial lane. ...read more. for long distances up to 3km carrying a single beam of light and the multimode is used for short distances up to 2km carrying multiple numbers of light beams which means more data. UTP & STP - these two stand for unshielded and shielded twisted pair which uses copper wires. The core of both of these is copper therefore this is a really good conductor and also is easy to work with. In both cables, the single wires are twisted to cut out crosstalk which is when they intermingle with each other. The STP cable has a shield round it which is a metallic coated plastic foil and is within the plastic sheath that is used block electromagnetic interference. These two devices work at 10 gigabytes and are used for network connection, to send and receive data. As UTP has no shield it is vulnerable to radio frequency and electromagnetic interference. Infrared - this device is used to wirelessly connect the phone to other devices such as other phones or the internet to send and receive data. This device can connect the phone to a computer, so that the computer can use the phone to make a data connection to the Internet. ...read more. Its goal is to have wireless connection on the mobile phone from anywhere and also with a high-speed connection of up to 2megabits per second. Using 3G you can have access to your Emails, also file transfers, video calling and full use of the Internet in its proper form. A lot of mobile brands are creating mobile phone devices with 3G built in, so an individual will be able to stay connected wherever he goes. How Does 3G Work - 3G stands for Geographical cells and has a hierarchal network of numerous sized cells. These are: * Marco Cell - this is the biggest cell of all three areas, it covers normally around the size of a whole city * Micro Cell - this cell covers an area about the size of a city center * Pico Cell - this is the smallest cell from all three, this only covers either a office, hotel or airport, this is also known as a hot spot The reason behind these cells are basically because shorter distance communications are faster and allow more users to use therefore this is used in offices etc. For example, a Nokia 6630 has 3G built in and below is the specifications. * ?? ?? ?? ?? BTEC NATIONAL (CERT) FOT ICT PRACTITIONERS UNIT 8 1 MUKID MIAH CLIENT SIDE CUSTOMISATION OF WEB PAGES ...read more. have had an impact on organisations 2 Understand why organisations need to change in response to information technology developments 3 Understand how organisations adapt activities in response to information technology developments. Documentation Standards 1. All documentation should include a header and footer. According to the secretary General of the International Telecommunication Union, Mr. Yoshio Utsumi, this phenomenal growth is expected to continue well into the first decade of this century when access to telecommunications services through mobile phones will soon exceed access via traditional fixed line networks (1). Such web forms include our Contact us Form and our Booking form, each of these web forms involve different types of validation, it is very important we use different types of validation on each form cell, too stop the user or customer from typing invalid data. Because multiple stations share the ring, medium access control is needed to determine at what time each station may insert frames. 3. Star Topology Star topology devices are all connected to a central HUB or concentrator. This is the most commonly used physical cabling network topology today. Stuck order forms would be used regularly in companies to order in stock for their products this ordering form would be used to send to the supplier details of the materials they need below is an example of and ordering form. certain types of brain tumors were more likely to report having used the phone on the side of the head with the tumor than on the other side. In fact, mobiles are held closer to the ear, thus more radiation penetrates the skull. 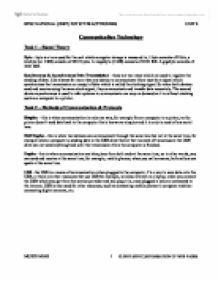 GUIDANCE NOTES This assignment is very much about explaining the basic theory that lies behind communication technology. There are lots of sources for this information in books and on the internet, but remember what you write must be in your own words; you cannot copy material directly from these sources.